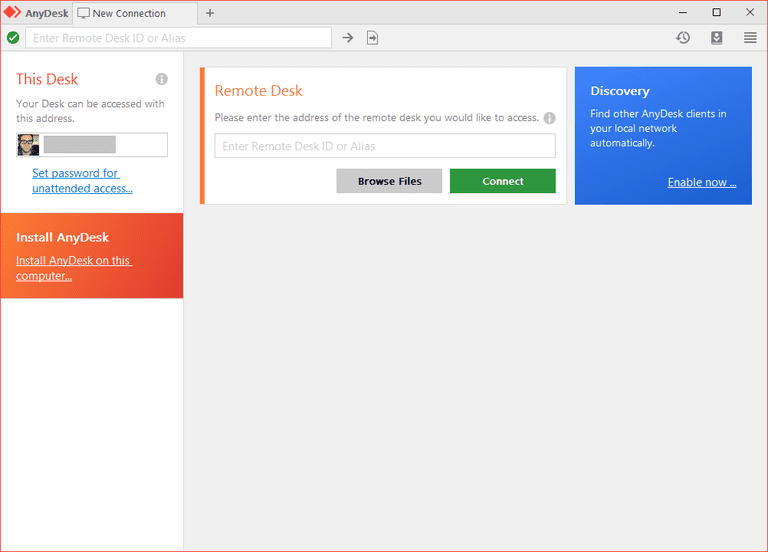 AnyDesk is a free remote access program that supports unattended access, doesn't require installation, can transfer files, and works without having to forward ports on a router. The tabbed browsing experience and condensed, hidden menus make AnyDesk very easy to use. Read on for more on all the details about AnyDesk, what I think about the program, and a quick tutorial on how to use it. This review is of AnyDesk 5.0.5 for Windows, which was released on April 12, 2019. Please let me know if there's a newer version I need to review. Similar to other remote desktop programs like Remote Utilities, AnyDesk uses an ID number to make establishing a connection easy. If you install AnyDesk instead of just run it portably, you'll be given the option to make a custom alias (like <yourname>@ad)to share with others, which is a lot easier to remember than a random string of numbers. When both the host and client computer are running AnyDesk, they can share the Remote Desk ID with the other and enter it in the "Remote Desk" part of the program to start the connection. The computer that's sharing their address will be the one the other computer will control. Set up a password in the settings to enable unattended access. You can also define the permissions remote users are given when they connect to you. Permissions allow them to view the monitor, hear the sound of the computer, control the keyboard and mouse, access the clipboard, and lock the user's keyboard and mouse input, among others. To install AnyDesk to your computer, open the portable program and choose Install AnyDesk on this computer. I really like AnyDesk and for a number of reasons. Unattended access is usually a desired feature for a remote desktop program but I also think quick, on-demand access is oftentimes relevant, and AnyDesk makes it easy to do both. Some remote access software require changes to be made to the router, like port forwarding, but AnyDesk doesn't require this. This means that the program can be downloaded quickly and a connection started in just moments. I also like that there's a full file transfer utility built in to AnyDesk. Some remote access tools only support file transfers via copy/paste, but you get a much more intuitive tool in AnyDesk.